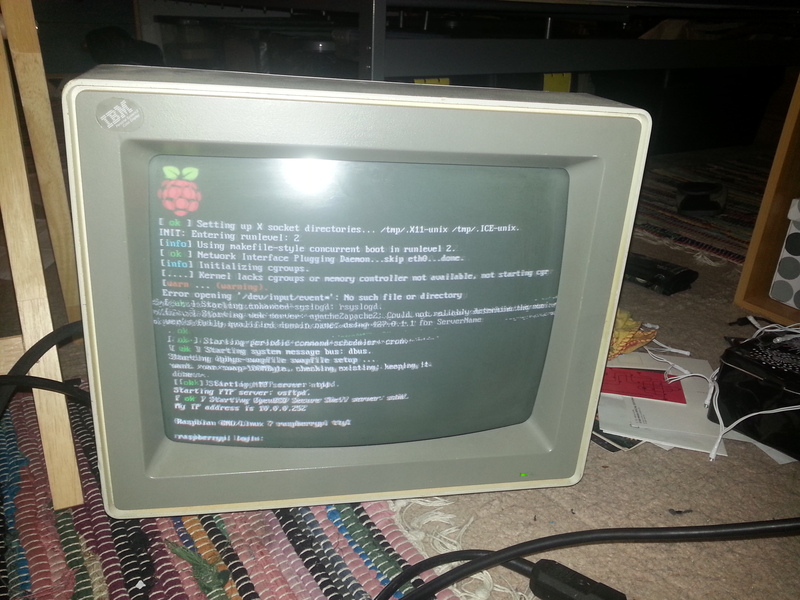 Retro IBM 12″ VGA monitor (8512) attached to a Raspberry Pi! I’ve had this monitor knocking about in the attic (used for years in the 90s) for years and I’ve wanted to do something like this. It’s taken me a while to get an HDMI to VGA adapter which actually supports 640×480 @ 60Hz. I was partly doing this for estetic reason (it’s awesomely retro) and partly because it’s an old device I wanted to breath new life into. I always try to reuse before recycling. hdmi_drive=2 (if audio supported by VGA adapter). When it first started I saw nothing but green snow. I thought it wasn’t working so I tried all the different relevent settings. It however turned out that I needed to restart the Pi somehow, whether by bridging the reset pins (this requirtes a Revision 2 Raspberry Pi), or by using sudo reboot from SSH command line (via network). If I were to make this a perfamant build (I don’t have the desk space or the spare Pi right now). I will likely wire a Solid State Relay to control power to the monitor from a pin on the GPIO (this monitor is way too early for automatic power control). I would also probably create some from of circuit to reset the Raspberry Pi automatically (to avoid green snow). Either using a 555N in monostable mode or a suitably programmed ATtiny45/85. This entry was posted in Members' Projects by Bugs. Bookmark the permalink. Do you have any more detail you can provide for a first time computer geek? The original VGA text mode was actually not 640×480 but 720×400. Unfortunately from I inderstand Raspberry Pi does not support a legacy real text mode. Its VGA 640×480 mode is a graphical mode, not text and it will always look kind of not right on the old CRT. If you want to have real VGA text mode you need to use a real PC.